By November 2016, Snapchat had over 301 million users monthly and by February 2017 there were 2.5 billion snaps per day. Many of their active users are between the ages of 14 and 21. This means some users are new to driving and will be tempted to look at their smartphones while behind the wheel of a vehicle. Teenagers and young drivers should be discouraged from Snapchatting while driving a car. Over the last two years Snapchat has greatly grown in popularity with millennials. Those between the ages of 12 and 27 are all over Snapchat. In fact, some marketing experts have stated that Snapchat could end up being bigger and more popular than Facebook. Why exactly is Snapchat so popular? It is a way for users to bring out emotions in the person they are “texting”. Snapchat offers users a way to send a photo that disappears in 10 seconds or less. Think of it as photo texting with pictures that are gone once they are viewed. The same can be done with texting or sending videos. A problem arises when Snapchat users are trying to use this app while driving. As an experienced Los Angeles car accident lawyer, David Azizi is well aware of the potential for accidents when drivers are not focusing on the road. Any time the eyes are diverted from the road and down to the palm of the hand there is an increased risk of a rear end accident or any type of car accident in general. Time and again we hear of case in which a driver looks down at their phone and the next thing they know they have gone off the side of the road and have hit a sign or a building or another vehicle. This is a very scary situation for everyone involved. Snapchat can be a very addictive app because the photos and texts are gone forever once they are viewed. Drivers that receive a normal text on their iPhone or Android phone can quickly glance down and see the text knowing it will be there to read in the future. The same is not true of a Snapchat text, picture or video. Once the piece of content has been viewed it can never be viewed again. With this being the case those looking at the content are going to pay even more attention. If they are behind the wheel of a car and they want to view a Snapchat picture 100% of their attention has been removed from the road. As if Snapchat were not addictive and dangerous enough, the company have recently added a filter that will allow users to share how fast they are going. We are certain the original intention was for Snapchat users to run, bike or ride on a golf cart showing how fast they were going in a video. Unfortunately, what has happened is Snapchat users are doing this while driving. 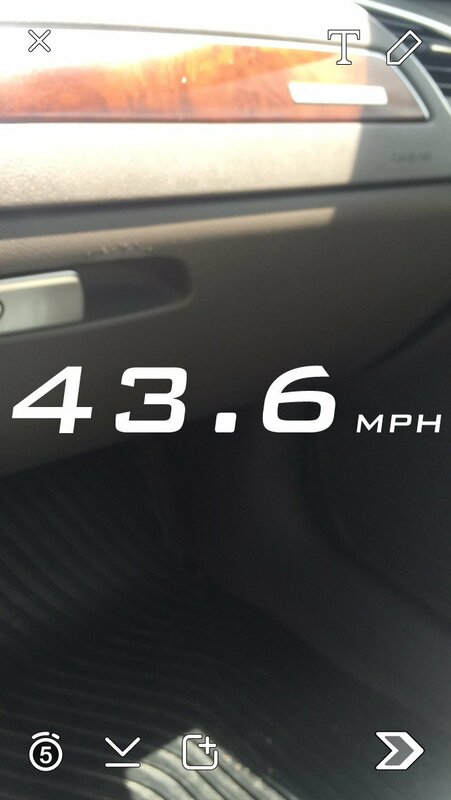 As you can see, the big and bold text clearly indicates the speed at which the Snapchat user is going. While it is safe to use this filter as a passenger in a car it is never a good idea to try and use it as the driver of a vehicle. As a Los Angeles personal injury lawyer, David strongly discourages anyone from using Snapchat while they are driving a motorized vehicle. Even if the vehicle is a dirt bike, golf cart or segway there is no reason to use Snapchat to take pictures or videos. When you are searching for a personal injury lawyer remember to hire the right attorney for you. David Azizi works hard to deserve your trust. He offers a free consultation during which he will review your case and answer any questions you may have. David knows that accidents can suddenly rob you of your income when you cannot work and inundate you with bills you may not be able to pay. There is no fee unless you win.